Yesterday, Adobe released Lightroom Classic CC 7.3. 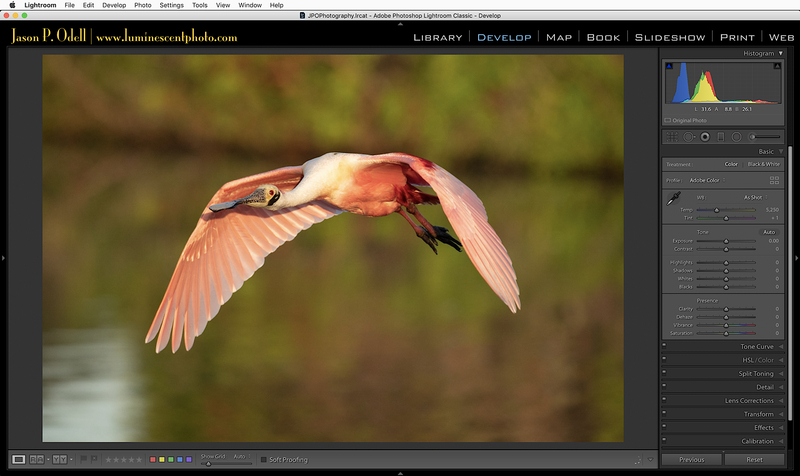 It includes some of the biggest changes to the Adobe Lightroom Develop Module in quite some time, so let’s take a look at what’s new in Lightroom Classic CC 7.3. If you’ve taken my Lightroom training or read my Lightroom eBook, then you already know how important Camera Profiles are. The camera profile sets the initial color and contrast parameters for your image upon which all other adjustments are built. 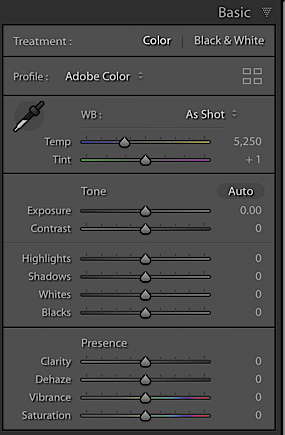 As a Nikon shooter, I’ve always preferred the look of the Nikon Camera profiles in Lightroom as compared to the default setting of Adobe Standard. In the new release of Lightroom, Camera Profiles are no longer hidden in the Calibration Panel, but instead go right up top, in the Basic Panel. In my opinion, this is where they ought to be, given their importance to the initial raw conversion parameters. Adobe has added new creative and raw profiles to make it easier to adjust raw images and add creative looks to any image. Not only did Adobe relocate their Camera Profile menu, but they’ve added a laundry list of new profiles. Adobe Standard is no longer the Lightroom default profile; it’s been replaced by an entirely new profile, called Adobe Color. I actually like this profile a lot; it’s a good all-around color profile and makes a nice starting point for most images. For users who want to protect highlights and shadows, there’s a new profile called Adobe Neutral. It’s a flatter contrast profile that makes a good starting point for high-contrast scenes. Of course, you can also use the camera-matching profiles that match Nikon, Canon, and Fuji in-camera profiles. Adobe also added a long list of “creative” camera profiles to create different looks for your digital images. Mark profiles as “favorites” for quick access to them in the Basic Panel. Favorites are added to the profile drop-down menu and can be accessed without invoking the Profile Browser. Note that you’ll only have the option to use the Camera Matching or Adobe RAW settings when you are working with a RAW file. The creative profiles can be applied to any image. The Dehaze slider moves to the Presence control group in the Basic panel. 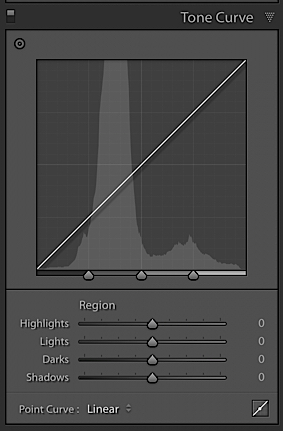 The Dehaze tool, introduced in Lightroom 6, was in my opinion improperly relegated to the Effects Panel. In Lightroom 7.3, the Dehaze slider moves to the Basic Panel, under the Presence controls. This is a great idea, in my opinion, as the Dehaze tool is actually a color/contrast adjustment slider. I frequently use it in combination with the Clarity and Vibrance sliders to fine-tune my images. To convert an image to black and white, you’ll need to first select a B&W profile. To convert your image to monochrome in Lightroom Classic CC 7.3, you’ll need to select a Black and White profile option. When a monochrome profile is selected, the Adjustments Panel changes function; from HSL/Color to B&W. Adobe increased the size (height) of the Tone Curve Panel to make it easier to use. While this is a cosmetic enhancement to the UI, it still makes sense. 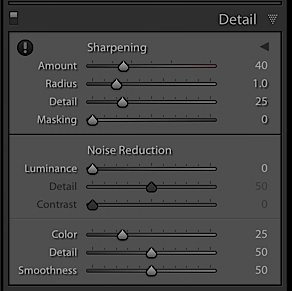 The new default setting for Sharpening is an amount of 40. I think boosting the sharpening setting to 40 is a good idea. If you’re not sending your images to an external editor, such as Photoshop, or a plug-in, such as Luminar, then this setting delivers an overall sharper image out of the box. You can change the Lightroom default raw conversion parameters on a per-camera basis at any time. Simply refine the parameters you wish to change and then press the Reset button in the Develop Module while holding down the Alt key on your keyboard. Adobe Camera Raw has been updated to version 10.3 and supports new cameras and new lenses. Check out Jason’s tutorials for Adobe Lightroom, or sign up for personalized one on-one training online.